Please note these are only to be used as a guide, please read all information below before using one of the Calculators. Fish require feeding, and they produce waste. This increases the amount of pollutants present in the water which can affect the water quality; therefore a pond with a lot of fish will require filtering more frequently to keep the pond water clear, clean and healthy. Plants aid in filtering a pond, a pond with a lot of plants generally doesn’t need as high a flow-rate through a filter as one with few. This is a pond with high stock-rates of fish, or with very large fish, and no, or very few, plants. This type of pond will accumulate debris and toxins relatively quickly and therefore will need filtering at a higher rate. The entire volume of water in a Koi pond should be passed through the filter once an hour to keep the water clear and healthy. A Goldfish pond is a type of pond which has an average amount of smaller to medium sized fish, and some areas of planting. This type of pond will not produce waste as quickly as a Koi pond and will only need to pass through a filter once every 1 ½ hours to keep it clean. This is a pond with no or very few fish, and a lot of planting. A nature pond will not accumulate toxins and debris as quickly as other types of pond, and water will only need to pass through a filter once every 2 hours. Pond plants need the sun to establish and thrive, but too much sunlight will encourage the growth of algae in the pond, turning the water green. The more sunlight a pond receives, the greener it will become. Passing the water through a UVC will help to rid the pond of suspended algae. If the pond receives a lot of sunlight it will need to pass through the UVC more frequently to help combat the algae. 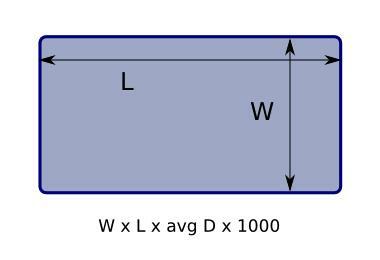 With rectangular ponds with round ends you are effectively calculating the depth of two ponds, a round and rectangular pond added together. 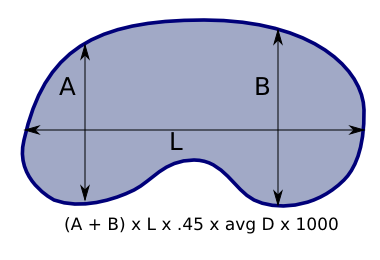 The formula for kidney shaped ponds is very approximate. 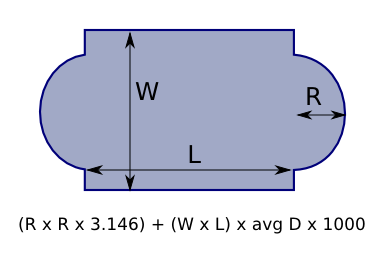 Round up to the nearest 500 liters when calculating the volume. 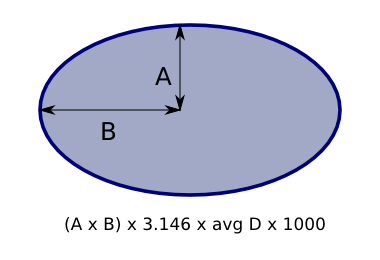 For elliptical cylinders you’r using the shortest (A) and longest (B) radius of the ellipse. 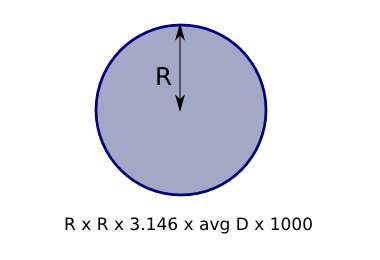 When calculating the volume of a cylinder, R refers to the radius. © 2019 Clearpond NZ - Water Garden Experts. All Rights Reserved.